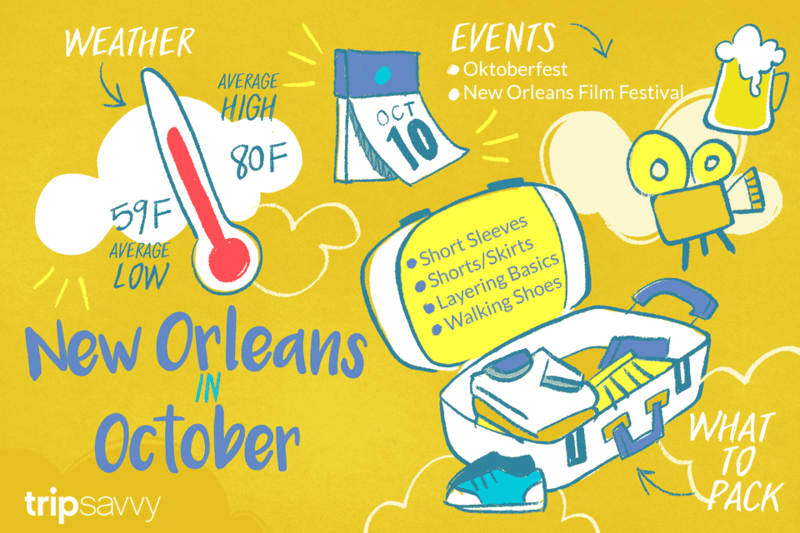 October is one of the most beautiful months of the year to visit New Orleans. The weather is warm, sunny, and pleasant, and fall festival season is in full swing. The Saints are rocking out in the Mercedes-Benz Superdome, and the Pelicans are just getting back to work in the Smoothie King Center. Second lines are marching through the old neighborhoods every Sunday. Basically, there’s a ton to do. Because of this, of course, you’ll be seeing higher hotel prices, but deals can still be had. Hurricane season in the Atlantic Basin runs from June 1 to Nov. 30, with mid-August to the end of October the riskiest time for a big storm to make landfall. Check the forecast before you leave since there are usually several days of warning about a tropical storm or hurricane threatening in the Gulf of Mexico. If it looks like you and it are going to visit New Orleans at the same time, reschedule your trip. If you are in New Orleans when a hurricane or tropical storm looms, the best idea is to leave as soon as possible to avoid being trapped there in a bad situation. Who wants to be on a trip and holed up in your hotel room? New Orleans breathes a big sigh of relief in October (barring hurricanes) after a sultry summer. Daily highs average a delightful 80 F, with the temperature falling to a cool and pleasant 59 F at night. October is the driest month of the year in New Orleans, so you will see the sun most of the time. It's perfect weather for dining alfresco, wandering around the French Quarter, and visiting New Orleans' unique above-ground cemeteries, along with checking out several interesting annual events. Odds are good that the weather will be quite warm during the day, so you can likely get away with short sleeves and shorts, skirts, and capri pants, but you’ll definitely want to have some layers on hand in case it cools off at night or you encounter an overzealously air-conditioned restaurant or store (likely). Take along a cotton sweater or denim jacket for nighttime adventures. Good walking shoes are always a must, but you might prefer comfortable sandals or canvas shoes for daytime rambles. October means great walks around the French Quarter, getting moved by great music at night on Frenchmen Street, and snooping around antiques and art galleries. It also means fine food at the Big Easy's iconic restaurants, like Brennan's, Commander's Palace, and Antoine's, among many others. As if that isn't enough, October is full of fun annual events in 2018. Art for Arts’ Sake (Oct. 6): New Orleans’ largest art-walk sees just about every gallery and museum in the city coming together for a night of art, wine, and company. With hubs on Julia Street, Magazine Street, and at the Contemporary Arts Center in the Warehouse District, there's loads to see. Carnaval Latino (Oct. 13): Parades, Latin food, and mucho music from around Latin America connect contemporary New Orleans to its history as a long-time Spanish colony. Events are held in the French Quarter and downtown New Orleans. New Orleans Film Festival (Oct. 17 to 25): Screening independent and feature films from around the world, this regional film festival has a reputation for excellence and draws a number of celebrities each year. Louisiana-shot and Louisiana-themed films are particularly well-represented. Crescent City Blues & BBQ Festival (Oct. 12 to 14): Brought to you by the same crew that presents JazzFest, this festival in Lafayette Square celebrates “the soul of the south” with—you guessed it—blues and barbecue. Krewe of Boo Halloween Parade (Oct. 20): New Orleans loves to throw a parade, and frankly, it does them better than anyone else. This Halloween edition, which rolls through the French Quarter, isn’t so different from what you might see at Mardi Gras, but it’s a fair bit spookier. There’s an enormous after-party you can also attend. Voodoo Music Experience (Oct. 26 to 28): The consistently diverse but crowd-pleasing lineup at Voodoo makes it one of the most popular music festivals in the Gulf South. It presents a full lineup of regional musical acts on Halloween weekend. The single most important thing to be aware of in October is the hurricane forecast. If there is one that's expected to be in New Orleans when you are, it's time to rethink your plans. If not, you're in for some great weather in the Crescent City for whatever you want to do. Book early: New Orleans is a year-round destination, and just because the summer is over doesn't mean there isn't a high demand for hotel rooms and restaurant seatings, especially on weekends, and especially on weekends when the Saints are in town. Watch your wallet: The French Quarter is where it's happening, but be on your guard as you would in any urban area, especially at night, when the action really revs up on Bourbon and Frenchmen streets. Eat outside: Take advantage of October's comfortable weather for some alfresco dining at New Orleans' legendary restaurants.